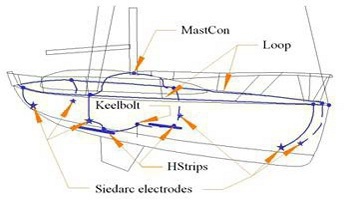 Ananda has the most advanced, state-of-the-art lightning protection system currently available, based on the recommendations of Dr. Ewen Thomson, President of Marine Lightning Protection Inc. (www.marinelightning.com). From his research as professor of Electrical Engineering at the University of Florida, he is considered the world's leading expert on lightning strikes, its effects, and best protection methods specifically with respect to sailboats. All ground wiring: 2 AWG tinned copper. Ananda's wiring follows the scheme to the right. 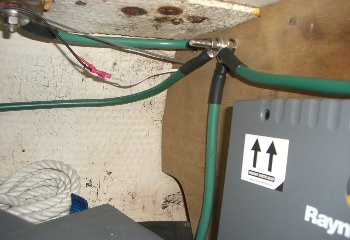 Wire post connecting loop wire to forward (starboard) Siedarc Electrode. 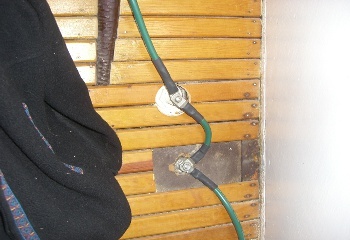 Siedarc Electrode connection, starboard side, forward (in boot stripe). 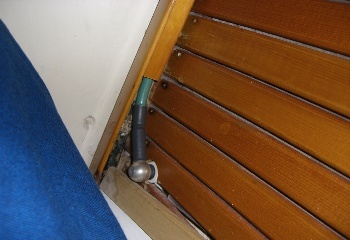 Connection of Siedarc Electrode, starboard side, opposite mainmast (in boot stripe), and connection to ground plate (just below waterline). Siedarc Electrode from the outside. 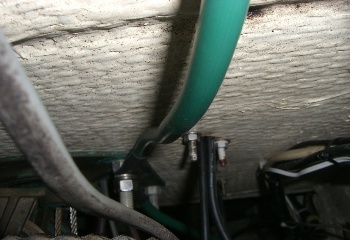 Also, you can see the ground plate just below the water line. 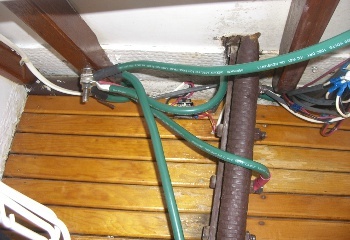 Wire post joining the loop, chain plate, mast where it comes through the cabin house, and the Siedarc & ground plate. 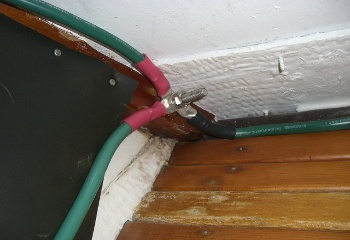 Mast connections to port and starboard where the mast comes through the cabin house. 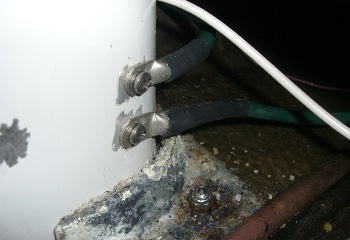 Mast connections to port and starboard at the mast step. 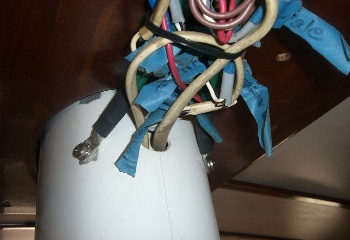 Wire post connecting mizzen shrouds, the loop, aft (starboard) Siedarc electrode. View under cockpit; connection of binnacle to the loop. With this system crew are much safer during a lightning event.